"it's The Banks That Caused It"
If the banks caused it, the argument must be that they caused the inbalance between government expenditure and tax receipts.... one assumes through a collapse in tax reciepts as a result of the economic woes. Here's a graph of private and government debt.... which suggests that the rate of increase of debt hardly changed during the crisis. 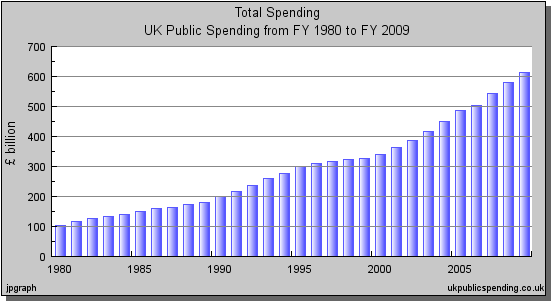 UK Gov spending.... where's the big jump due to the "bankers"? You are not missing anything. The regulators and government of the period have equal responsibility for the crisis. The taxpayer is actually making money out of the investment in the Banks. No to mention the tax revenue generated for the period preceding the crisis. The deficit has nothing to do with them. The Banks made an easy scapegoat for the previous administration who did not want to be blamed themselves. Despite the FSA and BOE MPC being set up on their watch. They did not ensure the Banks had sufficient capital as they did not believe a recession was possible. The great delusion. A brilliant piece of propaganda, swallowed by nearly everyone. Good OP - I've been thinking the same. It seems that because of their belief that the boom times would continue forever was wrong, it's the banks' fault. No, it was a flawed premise to begin with. I've heard person after person on radio5 this morning saying the same thing without any reasoned argument to contradict the claim that the bankers are 'wot cozed it'. If you think about it there really is no such thing as a 'Bank' or 'Government'. They are people. Nothing more and nothing less. There are huge structural imbalances in western economies, these have been building for years. When credit was free and easy these problems were masked. As soon as subprime collapsed these structural flaws have been revealed. Hence everyone blaming the bankers. The blame rests with many people for this mess, but the politicians won't take the blame if they can help it. So the bankers get to take it all. Mass stupidity isn't just in banking. It seems that the government loaned the billions by buying in shares which are now set to make a profit. The real fault was the bubble, and we could all see that coming for years. Blair knew about it and should have stepped in but he didn't. If those who criticised really believed that high house prices were here to stay, why did they react with fear at any suggestion that they may fall? Brown nationalised the banks for a laff, something to do - just for fun. They didn't really have any problems and were doing fine. Eric's rants about Liar Loans have no foundation in truth, the banks were honest and never made a mistake. Securitization was a good idea. Gordon Brown moonlighted from his job as UK PM to run the economies of the USA, Ireland, Iceland, Portugal, Spain, Dubai and a host of other places that are in the sh1t. No, I have no idea at all why the world's press or economists cannot see that it was all Gordo and that the collapse of Lehman Bros was due entirely to an over-order of teabags by the Food Standards Agency. the "deficit" (which is what we are discussing) was already massive prior to any bank bailouts, and the rate of increase has only increased a small amount. One has to conclude that the deficit problem is unrelated to the bank bailouts. as ccc implies - it's people - the banks could not have done what they did if people had not been daft enough to take out hideous amounts of borrowing, and if government had not encouraged both parties and been doing it itself. And the people returned the government to power TWICE to carry on doing the same. As I assume the banks only lent money to adults and not children. Then I assume those adults who borrowed the money and now cannot pay it back have to take some share of the responsibility. Or is that not what adults do these days, they crow when they win and when they lose they throw all their toys out the pram and cry for mummy. Grow up adults of the UK and take some responsibility. You need to read beyond the figures. There are figures showing that there has been a (say) 100 billion decrease in tax take from the boom years of 2006-7 to 2008-9. This drop is assumed to be systemic (I.e it won't ever go back up again). You then have to ask why. And the answer is because of a drop off in income from banks profits and rampant house sales. Ive not looked at any graphs, but i did read that there are 9000 civil servants of differing hues earning more than the PM. If that figure is correct then this would appear to be part of the problem. The main issue is this last excuse for a government spent the nations money bribing people with their own cash. History will judge you, you monumental, cretinous, psycho. Fair enough, but I didn't see many of these people complaining (or lauding for that matter) about the bankers/HPI providing all this extra income during the boom years... or asking whether we should be paying off the debt by reducing or removing altogether the deficit when times were good... no no no, we had to keep spending beyond our means to keep the wheels turning! If we'd kept spending sensible during this period, then a drop of 100bn in tax income could have been absorbed without massive cuts. The economy could have (maybe) sustained the welfare state on it's own to that level without catastrophe, but not in conjunction with the giant housing market freebie. The two problems had similar implications for the economy and fed each other so really can be treated as part of same dysfunction; they can be viewed as two welfare systems operating in parallel. In the end, through several routes (housing profits, well paid public jobs, public jobs that were non jobs, benefits), too many people were collecting other people's production without returning anything to producers. 1. Bank profits are/were taxed (simplistically) at 30%. At their peak, UK banking profits were never more than £50bn. At 30% that accounts for £15bn. 2. "Rampant" house sales contribute to tax through stamp duty and CT on developers profits. SDLT has accounted for £10bn pa at most. Developers profits in aggregate won't have ever exceeded those of the banks (nowhere near that number in fact) and would have been taxed at 30% max. So your statement doesn't hold water. Once again we need to differentiate carefully between the deficit and the debt. The bailout contributed meaningfully to the debt, but the deficit problem was there before and will still be there after all of Mr. Osborne's "cuts" sadly. The deficit remains a structural issue and readjustment will be very very hard. Of course you and ccc are correct; I've tried to say the same in the past but have had to think a little deeper about what I actually mean about that because it doesn't get to the nub of the issue - you are both correct in that it is entirely logical to blame any crisis within a human system (banks, tulips, environmental etc) on human nature itself. But we all know that so deeper thought needs to go into how a system can take into account human nature to make it more stable: the system itself needs checks and balances to ensure it doesn't take advantage of human weakness - greed - and it seems to me that the existing system - capitalism in its current form and particularly what has been going on within banking / lending - does exactly the opposite; it feeds off human weakness and doesn’t protect the system against it. So whilst it is easy enough to blame the individual for making their own decisions it doesn’t answer anything because every system created must surely take human nature into account as a starting point: you build the system around your base and work from there and so far capitalism – in the guise we have now – has failed to protect the individual or the system from human weakness which is a pretty fundamental flaw! Er......... Hang on a minute. The Banksters are STILL fine and dandy - STILL getting their "bonuses" - despite everything...??? You're not seriously going to try and tell me the Banksters are INNOCENT are you?? What effect did high house prices have on the economy other than your basic stamp duty analysis? Answer: they funded personal consumption on a grand scale; it is what has driven our economy for the last 10 years or more which in turn has increased profits for any company supplying products and services to the consumer.... EVERYTHING - TV's, cars, food - EVERYTHING... which in turn has increased tax take on a grand scale. House prices go down, people feel worse off and consumption goes down; look at today’s retail figures if you are in any doubt. And what does that do to tax take? You are thinking far too linearly about what effect HPI has had on the tax take by only using stamp duty in your figures. Since a bank's role in society is to allocate investment capital wisely, I would pretty much say that almost every recession is the fault of the banks. 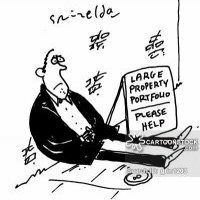 Particularly the current one which is characterised by malinvestment of huge amounts of capital into non-productive assets. Of course, they need plenty of suckers to believe them as well, but the way that banks create money really doesn't help people understand what they actually do. It's probably because the Tories were no wiser about the problems until it was obvious that the previous paradigm was well and truly dead. They were just as guilty of missing/ignoring the dangers of a credit boom, likely because it was something their party members actively encouraged and benefited from (wealth transfer from the poor to the wealthy, via HPI). There was very little vocal objection to the farce of encouraging HPI and relying on the 'profits' from it (or rather, the banks, stamp duty, etc) for government spending. Vince Cable was pretty much the lone voice, who was laughed at by Brown and dismissed by the Tories. The whole boom and subsequent, inevitable bust is a sickening concoction of naivety, greed and short-termism, propagated by almost the entire house of commons. Disgusting, really. EDIT: Even more depressing, the party of the poor (Labour) went to great lengths to screw them over, by encouraging HPI. They priced out millions, left the next generation with fewer jobs, unaffordable shelter and a dismal future. I'm glad they're out, but I despair that the only alternative is a bunch who don't even pretend to have the poor as a priority. It's a sorry state of affairs. You can expect the banks to try to make as much money as they can given the rules of the market that is in place. The banks need to operate to their full potential in order to be as profitable as possible. Failure leads to takeovers or bankruptcy. If the banks operate outside this system then the regulator needs to act. It's not the banks job to look at a particular activity, then say "this might lead to macroeconomic instability, therefore we better not do it". It's the governments job. The government and the regulator were asleep on the watch. They were asleep for 10 years. For 10 years mortgage lending in this country was increasing at unsustainable levels. The government should have done something about it. It did nothing. Labour supporters want to blame the banks, because the truth is unpalatable.